You think you know something, don’t you? You think you’re the clever little girl who knows something. There’s so much you don’t know. So much. What do you know, really? I put up excerpts from Joseph Cotten’s dialogue in part to present him as yet another predecessor of the Joker’s Nietzschean villain as portrayed by Ledger, in part to present evidence for Hitchcock’s purported misogyny. That’s a good comparison if we agree with k-prank that Joker is this psychoanalytic pH indicator for society’s mores (the ”death drive”). It’s also interesting to examine the link with Nolan’s PRESTIGE. In Shadow of a Doubt, there is a Splitting, which in THE PRESTIGE transforms into multiplication. Have you read Donald Spoto’s biography of Hitchcock, it is full of accounts of his misogyny. It portrays him as this frustrated Victorian chubby who abused all his platinum blonde actresses, with Tippi Hedren he even went so far as to send little dolls of Tippi in a coffin to her daughter (Melanie Griffith). Since Melanie confirmed the story, there could be truth in all this. 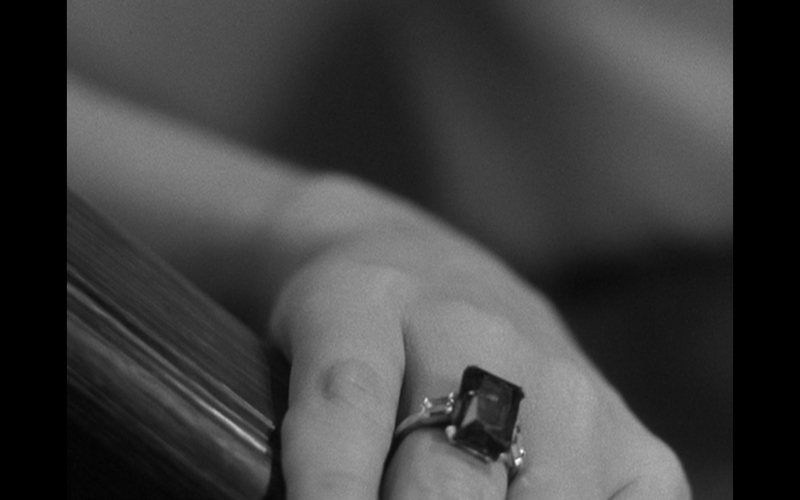 The screen shot of Joseph Cotten comes at the conclusion of his little speech about the “horrible, faded, fat, greedy women.” As he’s making this speech the camera slowly closes in on his face in profile; when he finishes he turns and looks directly into the camera. Is Joseph Cotten giving direct voice to Hitchcock here? He was shy, quiet, and he spent a lot of his childhood alone, making up games. He tried to ride every bus line in the city at least once, and he often watched trials at the local courthouse. He was close to his mother. Every night, he had an evening confession. Before he went to sleep, he stood at the foot of his mother’s bed and told her everything he had done that day. He did it every night, even when he was an adult and had his first job. As you’re well aware, Dejan, arguments have been put forward about Ledger’s Joker to the effect that he (a) channels attitudes and affect suffusing the larger culture or (b) functions as a propagandistic tool of Capital by embodying the preferred image of the opposition as nihilistic terrorists while simultaneously rendering attractive the urge toward violence that fuels fascism. 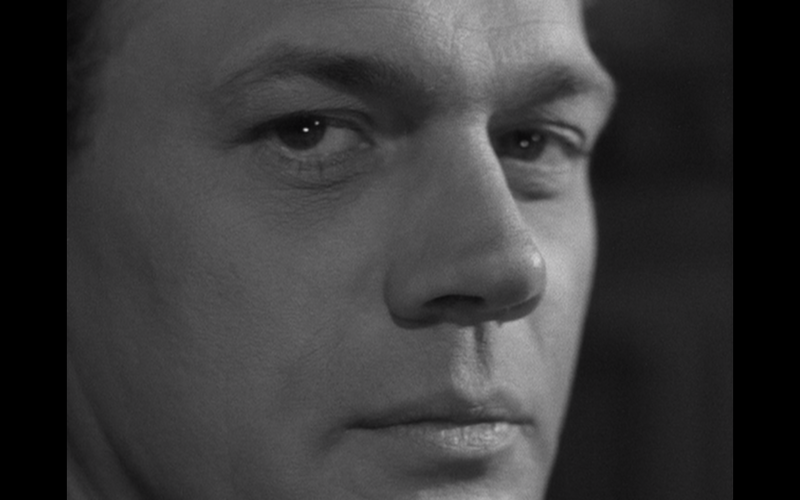 In Shadow of a Doubt we see the same ambivalence: Joseph Cotten’s character Uncle Charlie is clearly the bad guy, but he’s also charming and clever. The other rubes in the hick town present stark contrast: nice, friendly, banal, dull. When he makes his misogynistic speech we can’t help but agree with him a little, horrified though we may be with ourselves. Uncle Charlie dies in the end, but it could easily have turned out differently. And its his doppelgannger, his niece (also named Charlie), who gets the best of him and in effect kills him. There’s a fine line between the two Charlies, between the smart and resourceful good girl and her own dark side. Is Hitchcock using Uncle Charlie as a propaganda agent to get us to sympathize with him, or is he tapping into those Nietzschean antihumanistic instincts that already flow through “the best” of his Audience? Curious that this movie was released during the height of WWII. or (b) functions as a propagandistic tool of Capital by embodying the preferred image of the opposition as nihilistic terrorists while simultaneously rendering attractive the urge toward violence that fuels fascism. What would constitute evidence that goes beyond one’s ideological presuppositions and commitments? Let’s say I’m attracted to Uncle Charlie’s elitist queer mysogyny, which would stimulate me to dominate women emotionally and economically, thereby turning myself into an agent of sexist capitalist exploitation that dominates my culture. Isn’t it possible that my visceral attraction to this sort of thing has already been instilled in me not by my desires bubbling up from my unconscious but rather by all-pervasive propagandistic images and ad campaigns and socioeconomic circumstances that imbue me with false affect without my being aware of it? It’s a rhetorical question: of course that’s possible. And it’s certainly the case that marketing people consciously try to influence their audience at an unconscious level by stimulating affective attractors that would induce them to desire their product. What seems the most likely about movies is that the investors would want to find some set of affective receptors in the audience that are easily stimulated, then go ahead and stimulate those receptors consciously by building affect triggers into the movie. Whether these triggers are also intended to build audience’s emotional support for the capitalists behind Hollywood seems unnecessary. It’s more like the Wizard of Oz: “pay no attention to that man behind the screen.” If the affective triggers are so obviously self-serving as to become readily available to audience’s conscious processing, they lose their potency. Anyhow, I agree that Uncle Charlie brings some gayness to his misogyny. He’s a very natty dresser, and he smokes thick cigars. 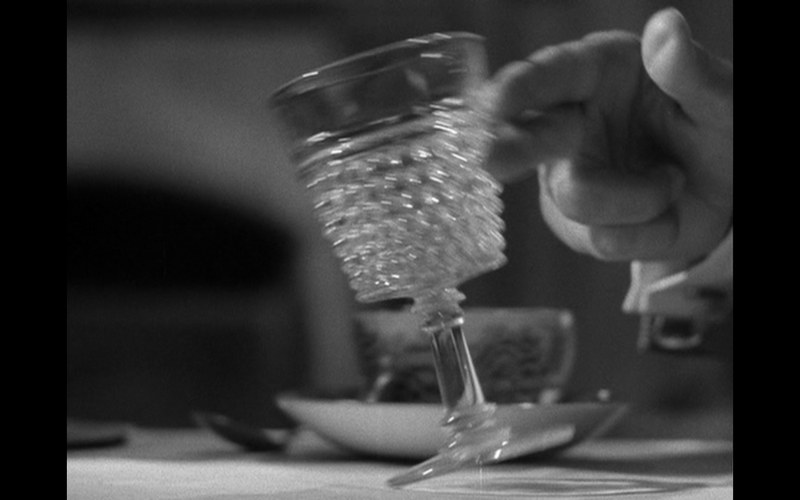 At the beginning of this dinner where Cotten delivers his monologue and then looks into the camera lens, we discover that he has bought a bottle of sparkling burgundy to serve with the meal. His very conventional sister (mother of niece Charlie) retrieves it from the refrigerator. Handing it to her brother she says, “Wine with dinner — how gay!” At the same time there’s a more polyvalent perversity to him: for a time it seems that he’d like to seduce his niece Charlie, which struck me less as a heterosexual attraction and more as another manifestation of his own narcissism — she’s like a younger version of me, so we should be together; I could teach her things. Do you think there’s an element of narcissism gayness generally speaking? instilled in me not by my desires bubbling up from my unconscious but rather by all-pervasive propagandistic images and ad campaigns and socioeconomic circumstances that imbue me with false affect without my being aware of it? He’s a very natty dresser, and he smokes thick cig..
Fashions have changed but I do believe there is a strong narcissistic component in homosexuality, starting from the fact that you are attracted to a body like your own, but then also my lifelong observation of PATHOLOGICAL forms of narcissism in many queens I’ve known and slept with. The question is is this a natural state of affairs (as Proust would have it) or do we subscribe to the idea that we need to pass through Oedipus in order to become ”adults”. Opinions on that one are strongly divided and there’s no clear-cut answer. Anycase in Halliwud representations the gay person is usually suave, well-mannered and narcissistic, as well as being connected to murderous pathologies. I thought “bubble up” as an image was more spatial than temporal. Anyhow, a distinctive feature of Lynch’s portrayals of unconscious content is that they combine amorphous primal stuff with bits and pieces from popular culture (e.g., the Loco-motion). It’s one of the ways the unconscious is like a language: it’s inside of us, and we’re inside of it. So our unconscious content probably contains a loosely structure array of all sorts of mismatched items, some from our early childhoods, some from the wrappers on our hamburgers. 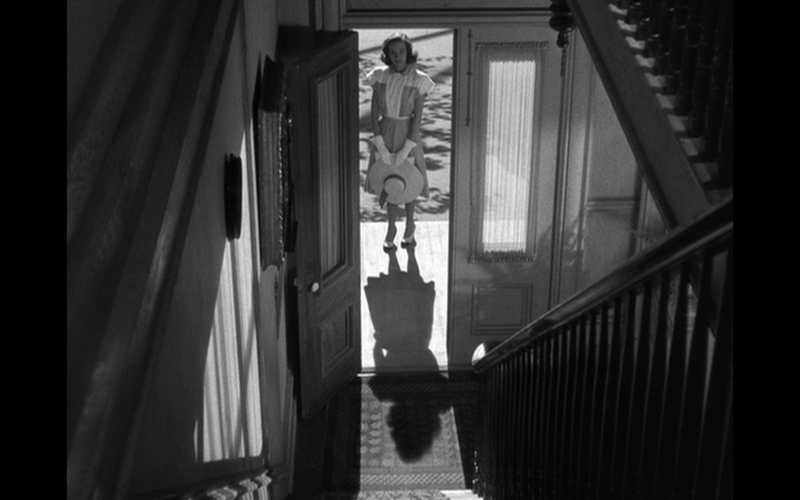 And it IS a great movie, though for me THE BIRDS remains Hitchcock’s finest, while Cotten has reason to be narcissistic. The Unconscious is supposed to be the fourth dimension: aspatial and atemporal. I think. Topological you might say. In the IE scene I sent you it’s remarkable how the space and the time are not exactly fragmented or broken, though the scene does make use of editing effects, but rather, ”stretched out”. I am still looking for definitions, but I recently bumped into a good blawg that dealt with topography in human language. I think I gave you the address, it was about Nikola Tesla.